Two years ago Guyanese in the arts offered much kudos to St Maarten-based Sir Ian Valz, an outstanding Guyanese and Caribbean playwright and dramatist for his movie Panman, Rhythms of the Palms which won awards at the Brooklyn Int’l Festival and top honours in the narrative feature film category of the 2008 Hollywood Black Film Festival (HBFF). But on Wednesday last, the arts fraternity of the Caribbean and Guyana was plunged into mourning with news that Sir Ian had passed away in St. Maarten. Guyanese would remember “House of Pressure”, a radio serial drama which was also staged at the National Cultural Centre and “Two’s A Crowd”. Valz was born in Hadfield Street, Georgetown and attended the St Mary’s Primary and St Stanislaus College. He promised to and did come home for Carifesta X. In 2008 he came to Guyana to see his mother, aunt and friends. His next project was a film titled ‘The Plantation’ which he originally wrote as a stage play. Ian Michael Valz, born in Georgetown, Guyana of Dutch ancestry, was knighted in the order of Oranje Nassau by her majesty, Queen Beatrix of Holland in 2006. A graduate of St Stanislaus College, Georgetown, Guyana, he also did theatre studies at the Theatre Guild. He held a Public Health Diploma, from the University Of Guyana. He began residing in St Maarten from 1984. He penned plays such as House of Pressure (also a radio serial) 1981; Two’s a Crowd, Room to let, Masquerade (Published by House of Nehesi St Maarten), A Passage to the Sun, Virgin In Black, Rhythm of the Palms which became the movie, The Panman, and The Peacock Dance which was made into a television movie in 2004. He also penned Separate Status, Breaking all the rules, Antillean House, [email protected], Borderline and Chiware’s Revenge. In 1990 he Co-starred in the N.B.C. television series Tradewinds, the first international movie shot on St Maarten. His role was Denny. He also wrote and directed the Peacock Dance and The Pan man in which he played one of the lead roles as Harry. All told, he directed over 60 plays, acted in more than 30. 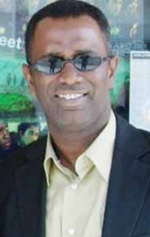 In Guyana he served as Sports and Cultural Director, from 1982 to 1984. Then he became the Drama Director of the Cultural Centre St Maarten from i985 to 1995. His next post was Artistic Director St Maarten Independent Theatre Foundation, from 1994 to the day he passed.